Summary: Everyone is looking for Geiger . . .
A few years ago, I reviewed THE INQUISITOR by Mark Allen Smith. This debut thriller received rave reviews, and I have to admit that it was a solid read with a very intriguing premise. The main charger, Geiger has some unique skills and in a complex character; and the author certainly knows how to weave a tale. I am happy to say that Geiger is back in THE CONFESSOR. In this novel, Geiger is missing and presumed dead; however, many individuals are searching for the truth. This book has already been called "a brilliant thriller" from Publishers' Weekly, and it sounds like another great novel of suspense. 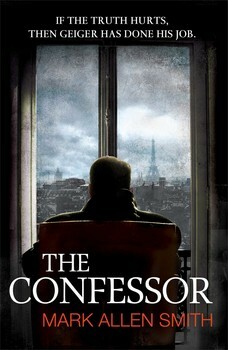 I have a copy of THE CONFESSOR to share with one lucky reader. To enter, just fill out the form below before August 5th at 11:59 p.m. EST. I will randomly select and notify the winner the following day. This contest is open to those of you with U.S. addresses only. Good luck! I haven't read the first one, but am happy to start here. Always happy to find a new thriller. Thanks for the giveway.